My blog journey through Mexico City has taken you through a hodgepodge of neighborhoods nice (Coyoacán, San Ángel, Polanco), not so nice (Tepito, Tlatelolco, Doctores), and “in transition” (Iztapalapa, Santa María la Ribera). The route connecting these barrios “bravos” y “mágicos” would, thus far, be something of a zig-zag…but rest assured that I still have a few more old DF haunts to share with you, Loyal Reader. 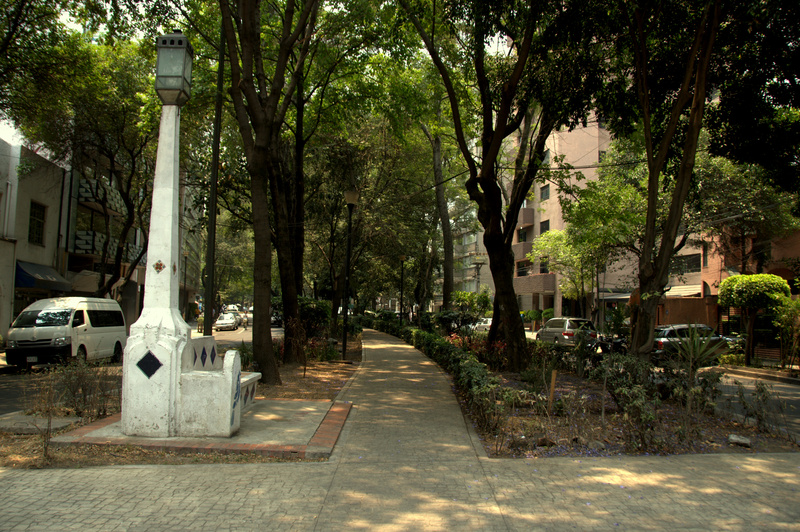 La Condesa, west of the Centro Histórico in Cuauhtémoc borough, is – and has long been – the stomping ground of Mexico City’s bourgeoisie. Impossibly-tall, stiletto-heeled Chilangas enter and exit luxury condos, cell phones in one hand and Fendi purses in the other. Professional dog walkers handle seven, eight, even nine dogs at a time, and make it look easy. Tree-lined streets branch off grand thoroughfares and lead to shady parks. Art Deco architecture competes with glassy high rises for attention and real estate value.